Do you think it is bad to feel ashamed? In this interview, Maarten Aalberse suggests that we have a tendency to feel ashamed about feeling shame and that this causes us problems. He suggests responding to those feelings with empathy and compassion instead of trying to reject these painful emotions. What does that look like? Shame comes up quite often for me. The other day, a participant in a session I was facilitating said, ‘Well I think this sort of thing is a waste of time. Nothing ever changes as a result.‘ and pop there it was… shame. Gnawing away at my gut. Making me want to crawl into a corner and hide. The conversation moved forward and we made a plan. I think that Maarten may be right. That allowing those feelings to be there and treating them with kindness may lead to more effective responses. 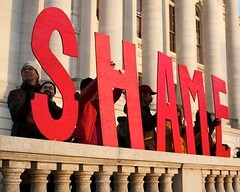 What about you…are you ashamed of shame? What happens when you treat those feelings with compassion instead? Does that work better for you? I can’t find the exact quote right now, but Helen Block Lewis wrote something that I believe to be key on this. And why we tend to go away from our shame. What I wished I had mentioned in the interview with Michelle Skeen, was that I find it important to differentiate shame and humiliation (= being shamed by somebody else).. Unfortunately, shame and humilation are often mixed up… i’m afraid Brene Brown, who we both love heaps, makes that mistake every now and then, which explains why she tends to see shame more negatively than I do..
And unfortunately, too, when we are ashamed of our shame, we expect the other to humiliate us and will perceive his responses as humiliating. Very painful interactions tend to occur, then…. What you describe, Rachel, can be a great way of moving beyond such a downwards spiral. Maarten, both of your responses are so wise and thought provoking. I can definitely relate to both the fear of humiliation and turning away from others shame. Sadly, I think that shaming a child is the most powerful way to get them to comply. So I think we learn to perpetuate that cycle of humiliation and shame. Yes, hélas, and… you inspire me to spend some time with my son, the next time I see him, totalk about some of my responses that “i’m not proud of”, explore with him how that has impacted him and what would have been more helpful response of mine, given what I was aiming for… Thank you for nudging me in that direction, Rachel! If (and that is admittedly not a small if…) I can be with « this shame, now », triggered in « this context », allow my self to be « not-knowing » and be with all that goes with this moment of disorganisation, something new can emerge. Then shame has become my ally. This is such a lovely discussion. Thank you. Martin, if I understand you, you are saying shame is when you humiliate yourself, and humiliation is being shamed by somebody else. James ! What a nice surprize to see you « pop up » here… (as an aside : how about writing together a little paper on you work with client-generated metaphors – that as you know I’m quite fond of – and ACT ? I’m convinced that there are many more parallels than meet the eyes at a first glance, and also some interesting differences). Yes, in the sense that, for me, shame is « between me and me », and humiliation between « me and invalidating or even abusive others ». However I would not describe shame as « humiliating yourself » . Humbling yourslf comes already much closer… But it still sounds a bit too « mindy » for me… I think that the first shame-response is especially an emotional one, rather than one related to self-talk /talking oneself down. IMO, it is a process of disorganizing muscular and cognitive patterns, when we « sense » that our present behavior does not lead us to where we want to go (the « failed intentionality » that Francis Broucek wrote about). Especially when we can’t accept this disorganisation, we start to struggle with it. And one of the forms this struggle can take are self-accusations. Don Nathanson has described this very well in his « compass of shame ».